Salpointe faculty member Bernard Carrington particpated in the Concept 2 Holiday Challenge with a goal of rowing 200,000 meters from November 28 to December 24, 2018. He surpassed his goal and was recognized for his contributions by Concept 2. Mr. Carrington rowed to benefit World Bicycle Relief, which helps people in need with the power of bicycle transportation. Mr. Carrington's commitment to the program will better the lives of people around the globe who do not have access to safe transportation on a daily basis. His efforts helped raise nearly $16,000. 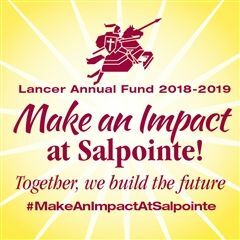 As part of Salpointe Catholic High School's commitment to Laudato Si, Mr. Carrington used a Concept 2 machine that does not use electricity. It operates using the resistance of a flywheel in the air to reduce the carbon footprint.